You can now login to MutaFrame to gain access to beta testing and access to exclusive features that we will be releasing in upcoming months. Lower user ids (earlier registrants) gain priority. I would like to post a recent project I have completed. The Mutaframe platform is a web app for single nucleotide variation affect prediction for human proteins. You can drag/drop your fasta files or enter the UniprotID. It currently harbors 1 prediction tool based on machine learning. 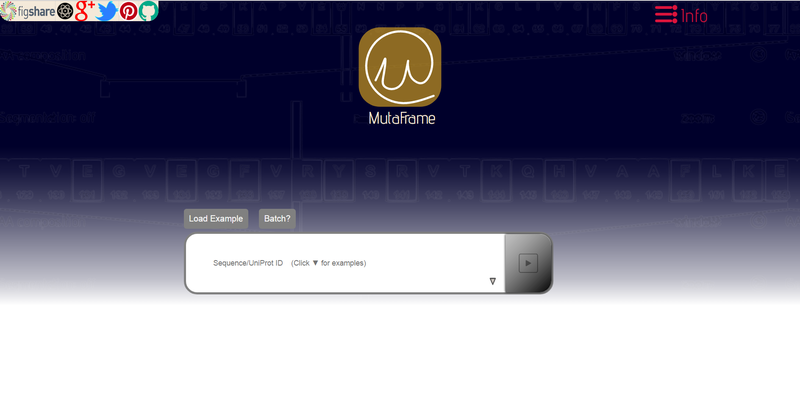 I am the front end developer of the Mutaframe platform and the visualization tools used within the page. The visualization tools used are collectively named 'Lexicon' and will be migrated to github account with tutorials on how you can use them. All Lexicon micro libraries are licensed under the license specified on the github. I would also like to thank all the co-authors and the people who put effort in the work, especially Julien Ferte who developed the backend/serverside of the platform. We have our 3rd party API ready and in test phase. If you want your application links to point to a certain mutation in Mutaframe.com, get in contact with me and request an API Key.